It changed everything. It brought music down from the stars and handed it to ordinary people. It gave a true DIY ethic to music production that allowed new ideas to flourish and entire sub-genres to form and blossom. You think I’m talking about punk from the late 70s, don’t you? I’m not. I’m talking about the punk principle that arose during the early 50s: it was called Skiffle. Skiffle was important. In fact, along with rock’n’roll influences, Skiffle begat beat music. From beat sprang game-changing outfits such as The Beatles that helped to forge the cultural renaissance during the 60s. In fact, artists such as Jimmy Page, Eric Clapton, The Beatles, The Who and The Kinks were all directly influenced by the genre, for example. For this column, I could have taken the clichéd position and focused on a Lonnie Donegan album but, although Donegan was the king of Skiffle, he wasn’t Skiffle. The genre encompassed much more but is still small enough to be considered as a focused, relatively niche, entity, hence this Masterworks is devoted to a genre instead of an artist. Unlike pop, rock or soul, Skiffle is a splintered kaleidoscope of small, yet intense, colours that are best seen in the round. Skiffle stems back to the early spasm bands of the early 20th Century and the later Depression era. I’m not making up that term, either. A spasm band was a real thing. ‘Spasm’ referred to bands who couldn’t afford proper instruments and used ‘found’ items instead: items that were not created for such tasks such as combs, tea chests, broom handles, washboards and the like. UK trad jazz groups discovered this music in the USA, tweaked and played it during their trad jazz gigs. 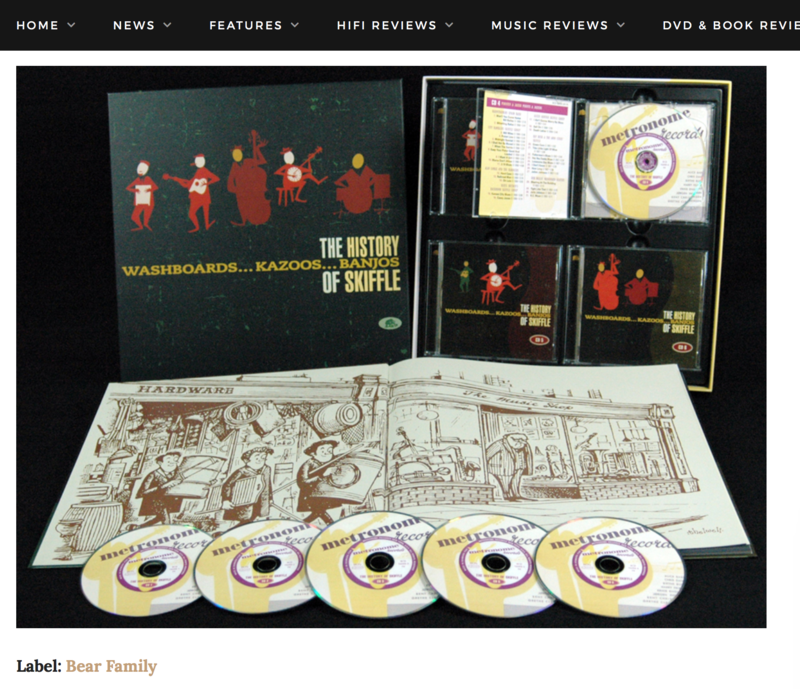 To celebrate this wholly significant musical genre, Bear Family (www.bear-family.com) released The History Of Skiffle, a box set of classic Skiffle music featuring a superb, hard-back book plus a range of acts onto six CDs. From Ken Colyer (with Down By The Riverside and Midnight Special) to Lonnie Donegan (Cumberland Gap and Rock Island Line), Johnny Duncan’s Last Train To San Fernando, Chas McDevitt’s Freight Train and The Vipers Don’t You Rock Me Daddy-O plus European outfits such as the Roban’s Skiffle Group and the Mozam Skiffle Group and a range of previously unreleased tracks.